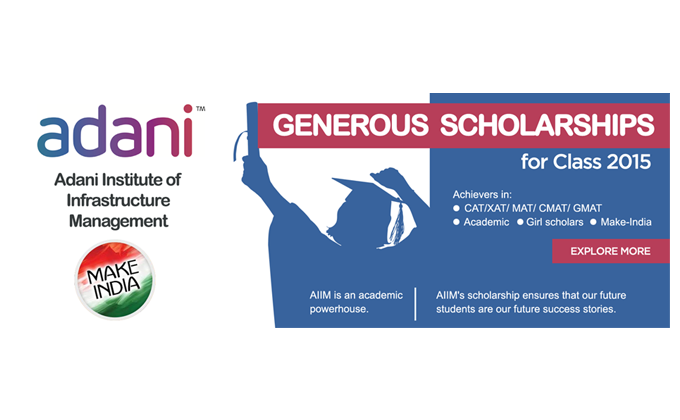 As a next step to make high quality Infrastructure Management education affordable for merito-rious students, the Adani Group-backed AIIM has announced a series of scholarships. AIIM is the initiative of AIER (Adani Institute of Education & research), a nonprofit foundation organisation of the Adani Group. These scholarships for the 15 months’ Executive PGDM and the 2-year PGDM course, range from one-time merit scholarships, to performance-based scholarships every semester. Those qualifying for Adani Institute of Infrastructure Management with a CAT/XAT percentile of 90 and above are eligible for a one time waiver of Rs. 50,000, while those who score between 80 and 90 percentile get a waiver of Rs. 40,000. Selected students who achieve the mark of 70 percentile, but are less than 80 percentile get a one-time waiver of Rs. 30,000/-. For CMAT / MAT, 10-15 percentile more than this will be treated as equivalent. For GMAT, an overall score of 650 is likely to be taken as an equivalence of 85 per-centile of XAT & CAT; an overall GMAT score - 500 may be taken 75 percentile equivalents. In order to encourage more girl scholars to pursue infrastructure management education, AIIM announces a special one-time incentive scheme for girl students admitted to PGDM courses by offering a waiver of Rs 50,000 in the first quarter/term’s fees. The Adani Institute of Education and Research has also announced a generous 10% discount on tuition fee for Adani Group Employees and their wards. As an added incentive to build on their Infrastructure Management abilities, these working executives of any of the Adani Group compa-nies, who take a break to pursue their PGDM or E-PGDM in Infrastructure Management at AIIM, shall be offered an upgradation on rejoining after successful completion of the course. The right infrastructure is quintessential to turn India into a manufacturing hub. While welcoming the ‘Make in India’ campaign, the Adani Group is deeply conscious of the fact that we first need to ‘Make India’. AIIM scholarships are in sync with this particular objective, since managerial capacity building is the biggest challenge today in the infrastructure industry. Keeping this in mind, AIIM has on offer a scholarship amount of Rs 50,000 for four for each- PGDM (IM) and E-PGDM (IM) aspirants. Students who have missed out on the admission-level scholarships, will be eligible to Grade Point average (GPA) based scholarships, which will come up every trimester (3 months). In addition, cer-tain meritorious students of the 2-year PGDM course will be allowed to do a full-fledged Summer Internship, directly under the CEO’s office of the various companies of the Adani group. AIIM is a brainchild of Mr. Gautam Adani - also the Chairman of Adani Institute of Infrastructure Management. Mr. Adani, a first generation entrepreneur, is the Chairman and Founder of the 8 billion dollar Adani Group, and amongst the 10 Richest Indians. Founded in 1988, the Adani Group started with Port Infrastructure, and in a very short period of time grew into a globally integrated infrastructure player with businesses spanning coal trading, coal mining, oil & gas exploration, ports, multi-modal logistics, power generation, Agri Infrastructure, edible oil & transmission and gas distribution.